Aviation Logistics by Michael Sales is a neatly put together study of the past, present, and future of air cargo and transport. Sales adheres to all of the challenges he lays out for the industry as a whole – namely, he integrates coverage of other modes of transportation as appropriate. The visuals, both photos and graphics, are a nice touch and are worth whatever additional effort their inclusion required. 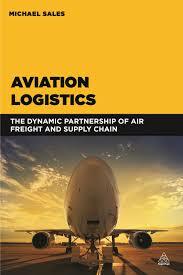 The discussion and level of technical detail read well without advanced specialized knowledge of air freight. According to the author, air freight dates back to the end of WWII with the Western Allies dropping provisions into Stalin controlled East Berlin to break a blockade. Fast forward to today, much has changed but many things also remain the same. Remarkably, the 6-7 day average time to move goods by air has not changed in 40 years, with many gains in equipment and technology performance being cancelled out by increased regulation for security and environmental impact. 35% of global cargo is classified as air cargo, but it holds a peripheral role in many airlines, who view passenger transport as their primary area of focus. While air freight is a key revenue stream it is not seen as being their core business and is often given insufficient consideration as a result. In fact, many airlines have outsourced their ground operations, an opportunity to increase efficiency to be sure, but a lost opportunity to differentiate. Like other players in logistics, air freight has been affected by the rise of eCommerce. B2C shipments may be sent fast, but their size doesn’t meet the conditions required to leverage the benefits of air freight transport. Capacity significantly exceeds demand, and this is expected to remain the same for the next decade. The primary competition for air freight is ocean freight, and the relative costs of the two modes put air freight at a disadvantage in most cases. Unsurprisingly, two of the best case studies for air freight involve the global shipment of seafood. Seafood meets the two characteristics of product that is well suited to air freight: high margin and perishability. The case study on The Fish Company, a UK based fishmonger, not only lays out the obstacles to be overcome with intermodal freight including air transport, it is a study in determination to make a unique business model work. The author makes exceptionally clear that this is an industry that faces extinction if approaches and conditions don’t change. And this change is required on all fronts and in cooperation with others in the supply chain. These changes include technological advances such as the IATA project ‘e-freight’ and learning to share information more proactively with supply partners.